Genesis Automotive & RV Repair located in Tacoma, WA has provided complete auto service, RV Repair, trailer repair, and fleet to the community for over 20 years. We have a great reputation in the community for not only providing great RV and auto service but also fleet repair and horse trailer repair as well. Our technicians are ASE certified and always available to answer and service questions you may have. 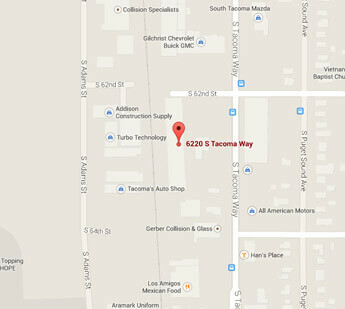 We are conveniently located at 6220 S Tacoma Way and S 62nd street stop by for honest estimates and reliable repairs. Call (253) 473-2336 or schedule auto service online today. Our shop is over 10,000 square feet and armed with the latest tools and diagnostic equipment to handle any RV repair or upgrade you may need. Whether you have had a recent collision or would like to add solar panels to your RV, our team is dedicated to providing you the best service possible. We are currently an Onan authorized generator dealer and repair facility and honor many manufacturers warranty as well. Electrical, plumbing, suspension, and brakes, our team does it all. The best part is we guarantee our RV repair and services. Being Tacoma’s expert horse trailer repair, service and customization experts we take pride in providing our customers with exactly what they want. Whether you need minor trailer repair or custom fabrication, we are the team you want working on your horse trailer. Local and dependable we also offer maintenance, winterization, and safety inspections, and more. Why go anywhere else when everything you may need is right here at Genesis. Just check out our many reviews then call for an appointment. Do you need something changed or remodeled in your RV or Trailer? Then call the experts at Genesis Automotive and RV Repair. Whatever you may be looking for or need done our team should be your first call. We have a great reputation for providing top-notch customer service and satisfaction. We can turn your latest nightmare into a thing of the past. Call today and schedule your appointment to see how we can help remodel and customize your RV or trailer. Genesis Auto & RV understands how important it is for your fleet to be operational and running smooth as much as possible. Our dedicated fleet repair technicians will provide full service auto repair and maintenance that will keep your fleet running stronger for longer. Not only will we help improve gas mileage but also reduce unexpected downtime and breakdowns. Get the most you can out of your fleet with Genesis. Call today for an estimate. Genesis Automobile and RV Repair provides excellent customer service, vehicle repair, and maintenance. For your convenience we have free loaner cars upon request and local shuttle service. Check out our specials page for valuable savings on your next visit. We are open Monday through Friday, 7:30 am to 5:30 pm. Call (253) 473-2336 or schedule service online today.